tend to discernment and proper manner in action and attitude regarding customers, staff personnel and fellow humans. As one of the first commercial activities METEK installed a comprehensive monitoring of acoustic windprofilers (Doppler SODARs) operationally used in a network to determine meteorological dispersion parameters for pollutants dispersion models needed in case of accidential release of hazardous materials. The concept used as one of the first reported installations small PC units with XENIX operation system and included an automatic data transfer via regular remote access by modem technqiue and a daily data quality inspection. 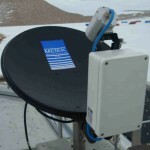 Another early project comprises the development and installation of a 3 antenna Doppler SODAR system DSDR3x7 with FFT-technique for signal analysis and digitized signal generation. Furthermore, a newly designed digitized 3 dimensional sonic anemometer thermometer USAT-3 was launched as an in-situ sensor for wind and turbulence measurements. The continuous improvement of available products and the development of new techniques was always seen as a vivid element of METEK’s business. Following this approach METEK succeeded to launch an innovative 3 dimensional ultrasonic sensor (USA-1) which offered a challenging price/performance ratio unseen before. 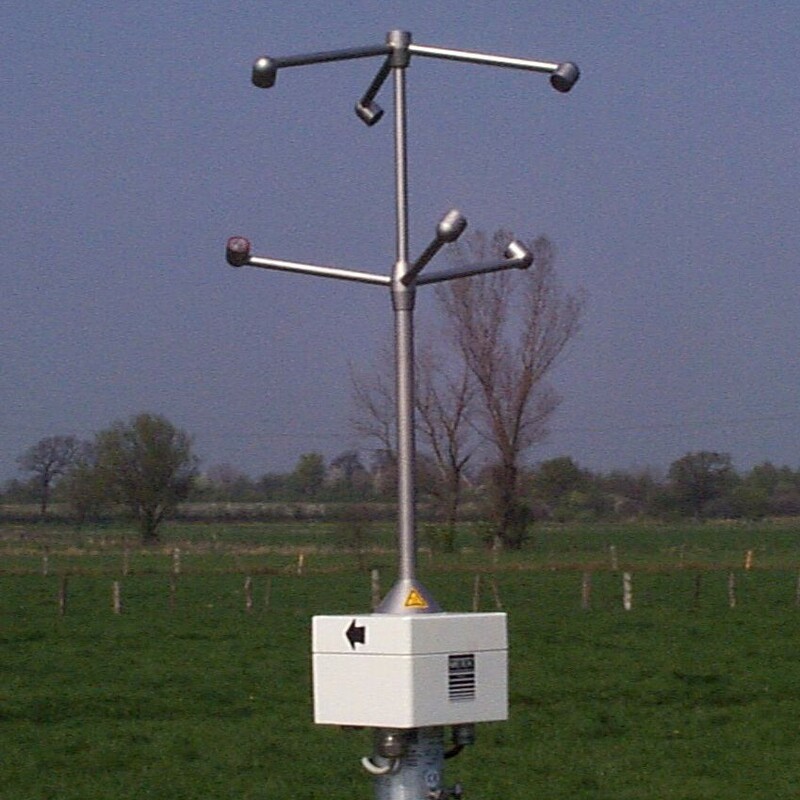 Since 1993 the USA-1 has been installed in thousands of world wide installations, inter alia for climatological studies and in eddy-correlation systems monitoring vertical fluxes of water vapor, carbon dioxide, ozone, etc. While eddy-flux stations were mostly involved in the scientific work the USA-1 was offered also with an turbulence extension for routine measurements of online derived variances and covariances of x, y, z wind components and temperature, fluxes, Monin-Obukhov-length, diffusion classes for routine measurements. An efficient sensor head heating and an integrated online data quality check qualified the USA-1 as an all-weather type sensor with minimal maintenance efforts. 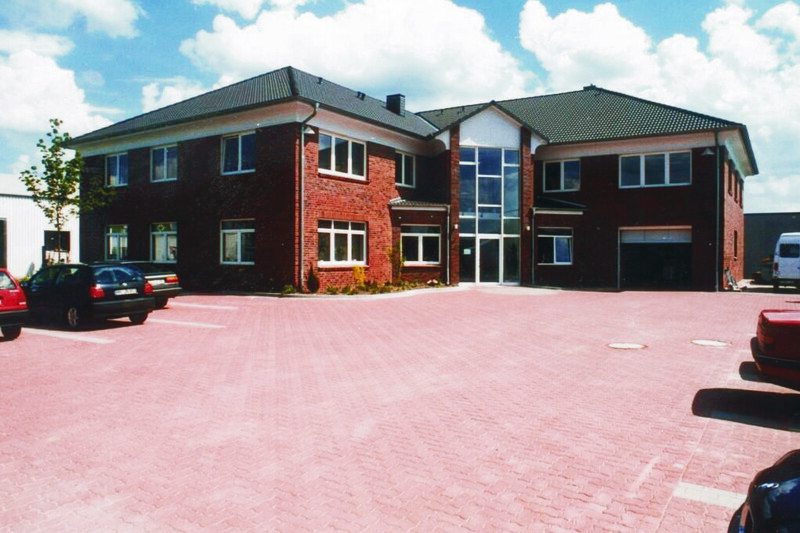 According to the needs of the extended commercial activities and grown staff personnel METEK moved into a newly constructed building in Elmshorn near Hamburg. With this move METEK’s capabilities in development of new techniques and production improved significantly. The new premises located in an industrial area with a number of sub-suppliers situated in the nearest neighborhood gave also extra space for an outdoor test area of 500 sqm allowing extensively checks of our products under real weather conditions. 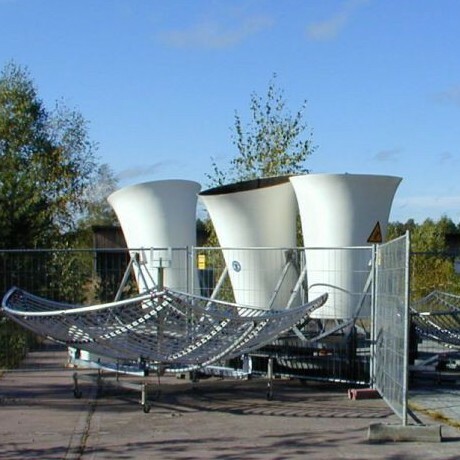 The conventional 3 antenna sodar system was replaced by a first phase-array antenna system DSDPA.90 with special shaped acoustic shields to provide perfect beam forming and side lobe suppression. 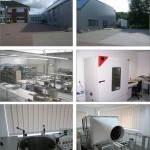 It combined easy handling and high performance for a very competitive pricing. Some of these system have been in use for more than 20 years of continuous operation. 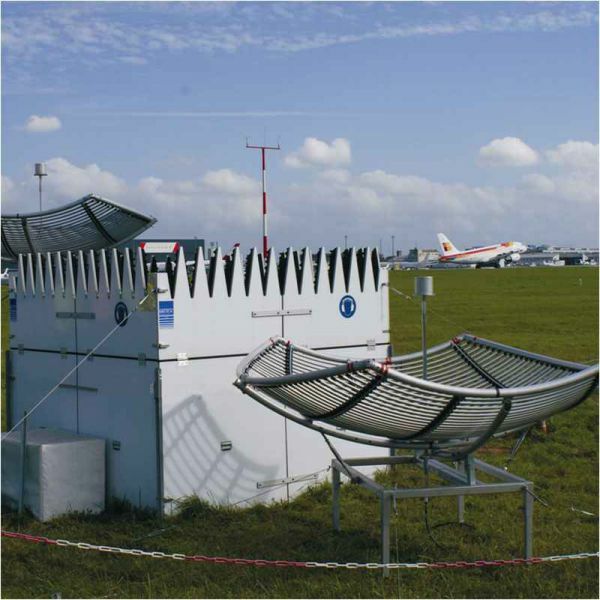 An innovative approach for a cost-competitive vertical sounding micro rain radar (MRR-1) was started by utilisation of an industrial 24 GHz radar module. 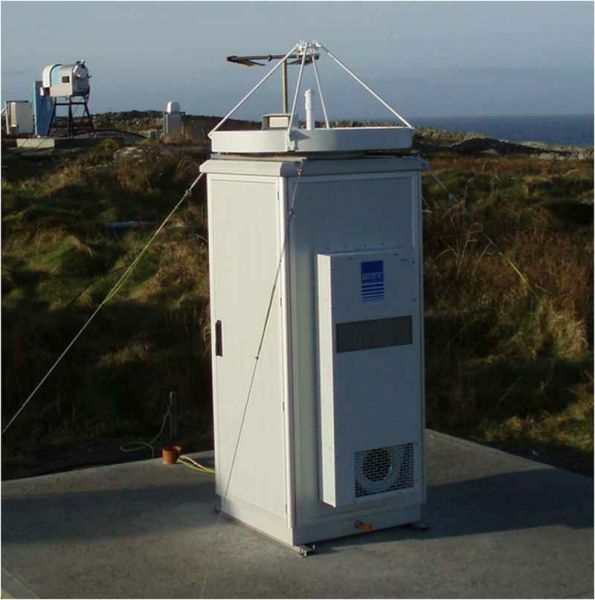 Primordially the focus was put to accurate rain rate measurements on marine platforms or at coastal sites (“ZISCH” project) when conventional rain gauge measures suffer during high wind speed events from the flow effects of the surrounding obstacles. Soon after the first successful tests the benefits of this technique for any kind of vertical rain profiling were identified. 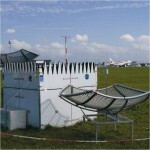 The micro rain radar MRR-2 became a striking new tool for precipitation monitoring and rain measurements. 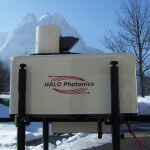 With its disdrometer profiling function and the simple identification of the bright band indicating the melting zone of frozen particles this system implicates the capability for an online calibration of weather radar systems. 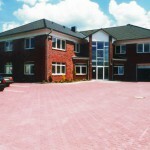 Initiated by the european EUMETFREQ group the MRR-2 was adapted in 2008 to the recommodation of the ECC166 council. After introduction of an internal quality management system METEK successfully passed the certification audit EN ISO 9000:2001 by TÜV Nord CERT which has been transferred in the meantime to DIN ISO 9001:2015. This QM-system covers the whole range of METEK’s commercial activities of development, manufacturing and sales of all our products. 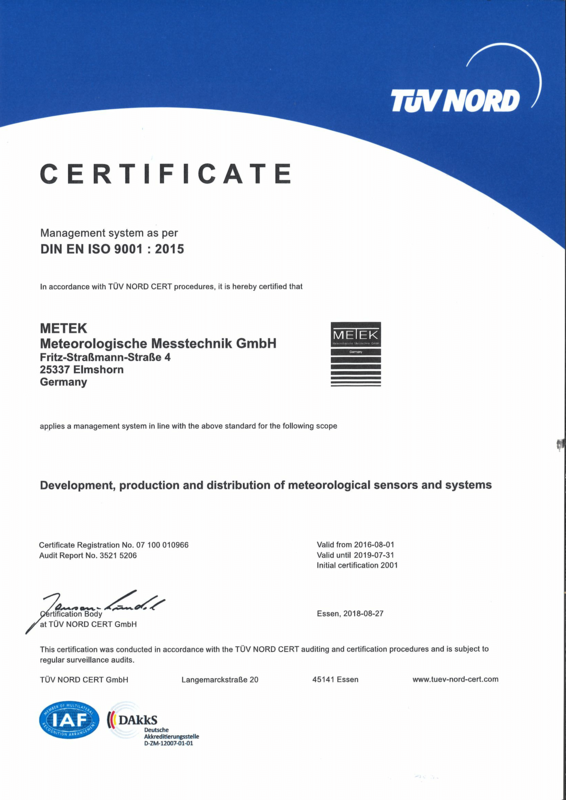 In addition Metek has been certified as a supplier of german nuclear facilities according to KTA1508 and offers the sonic anemometers and sodars with the corresponding certification proof. For the german army METEK provided instrumental set-up according to AQAP standards. 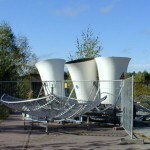 A fully computerized new type of Doppler SODAR system PCS.2000 was launched which allows vertical wind profiling up to 500 m in a transportable version and to more than 1000 m in the long range versions. This system is implemented on a standard WINDOWS based PC using sound cards for signal generation and signal anaylsis while offering the full performance and flexibility of todays PC units. 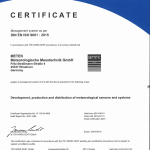 METEK delivered the first Ka band cloud radar system MIRA-36 (36.2 GHz) to the Max-Planck-Institute for Meteorology in Hamburg. 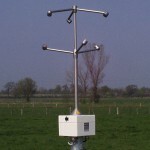 This unique device delivers vertical profiles of reflectivity, vertical wind components and linear depolarisation of all clouds up to 15 km height agl at the user’s finger tip. Meanwhile 15 units of such MIRA-36/MIRA-35 cloud radar systems have been installed in different configurations including several full hemisphere scanning trailer systems. Most of the delivered systems are used routinely with extraordinary operational uptime values. We gratefully acknowledge that our customers agreed to host the online cloud radar data in a comprehensive data archive to share the plots of the current and prior measurements with our visitors. A further extension of the Metek premises increased the available space for administration, development and production to more than 1100 m². Among these areas are extra facilities which respond to the increasing demand for stand-alone trailer versions for our profilers (Doppler SODAR PCS.2000, Cloud radar MIRA-35). 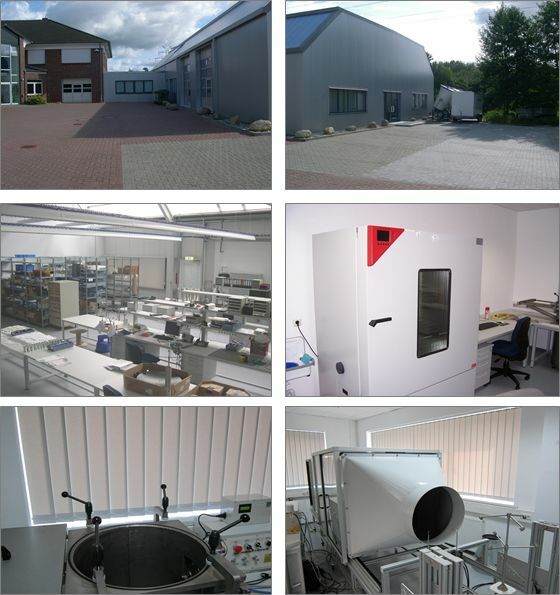 A comprehensive laboratory for calibration and some environmental testing devices (temperature, humidity, pressure, wind, vibration) have been added allowing in -process control and final acceptance tests under varying climatic conditions, i.e. within -30 °C … +80 °C, 5 % … 100 % or 250 hPa … 1500 hPa. These tests are included in the internal quality assurance program of our manufacturing processes and are an integral part of the ongoing development of products. 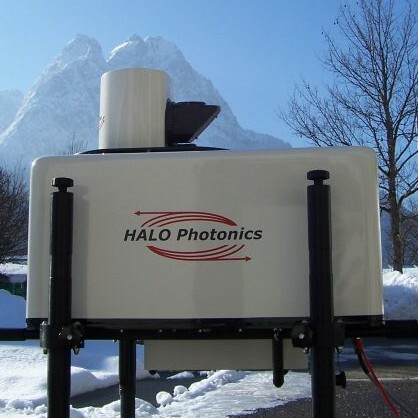 A close cooperation has been installed with Halo Photonics, a well reputated Great Britain based company developing and manufacturing eye-safe Doppler-Lidar systems “Stream Line” at 1.5 μm for profiling of the atmospheric bounday layer and of clouds up to 10 km height. The cooperation targets to boosting sales and customer relations within the DACH area and other countries while adding value by implementation of data analysing tools and technical accessories originally developed for the Doppler SODAR PCS.2000 and the Micro Rain Radar MRR-2. 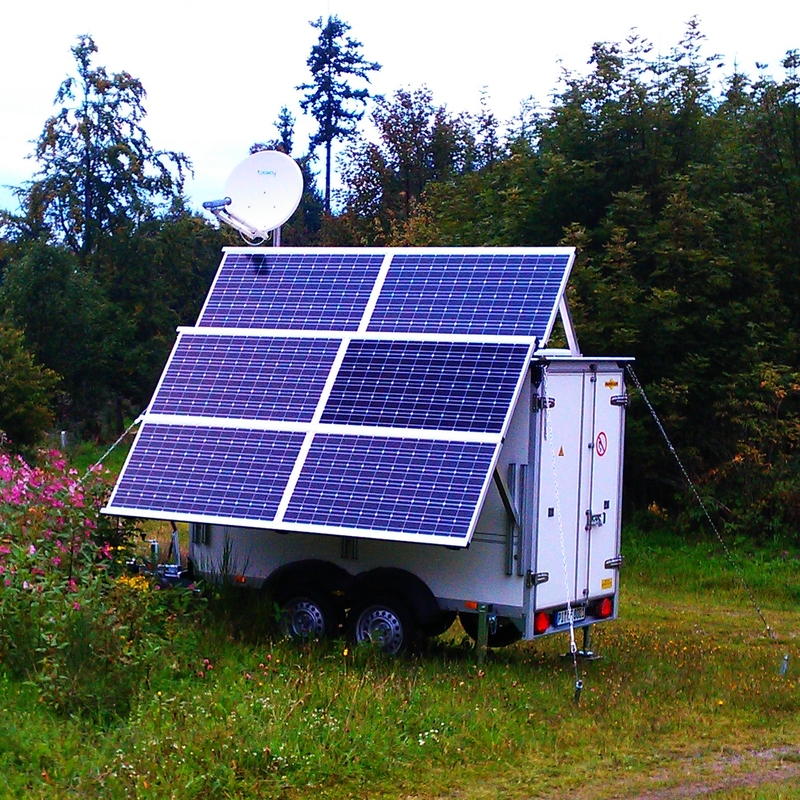 Today more than 15 Stream Line systems have been installed either as parts of monitoring networks, as research instrumentations or as stand-alone trailer versions for measuring campaigns at remote site. 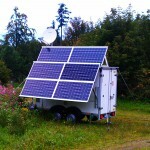 Metek completed its pool of available renting systems (PCS.2000, uSonic, MRR-2) by 2 trailer versions of Stream Line Doppler Lidar systems, both powered by solar panels and fuel cell technology. The data access via GPRS or satellite communication allows an efficient monitoring of the ongoing measurement and easy data transfer and nearly real time data plausibility check.